This site will be migrating to a new address. Please do not leave any more messages on this blog. I will not be publishing or responding to any more comments left here. You will be automatically redirected to http://www.atkokken.com All posts have been migrated. You will be able to locate any posts by performing a quick search at my new site. Thank you. Food bloggers like us - we cook at home, we have cookbooks, we watch cooking programs and we attend cooking classes - everyone of us, I suppose, fancy ourselves as a bit of a cook. When we see our own cooking captured on film, it brings us a little closer to the wishful notion that we could perhaps be more than 'a bit of a cook'.... and do I even need to mention that we, food bloggers, have mastered the ethereal art of eating with our eyes? I remember when I told my friends how we would visit each others' blogs leaving comments on the food - they had asked me, quite matter of factly, ' but they have not tasted your food, how do they comment on your food? ' To that, I replied sagely : we eat with our eyes. Indeed, perhaps, one of these days, when we do get to taste each others' fare, we could be grossly disappointed and disillusioned but what is also true is that our knowledge of food has become more astute, we have become more aware and informed about the different tastes, ingredients and preparation of food - leading to higher expectation and appreciation of what would perhaps be just lunch or dinner. When I had told L that I made this for dinner tonight and quite ignorantly asked if they have Fish Head Bee Hoon in KL, he had replied with an almost audible snort, ' of course we do, where do you think Singaporeans copy from? '. Absolutely futile to talk to him about food commonalities between Malaysia and Singapore. 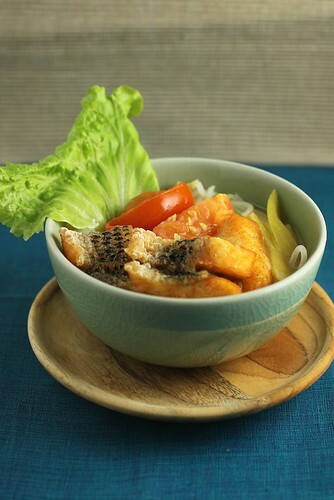 I used the recipe from local celebrity chef, Sam Leong's 'A Taste Of Home'. Sam Leong, who hails from KL (eyes rolling) is the Corporate Chef and Director of Kitchens for the Tung Lok Group, which own more than 20 world-class restaurants in Singapore, Indonesia, China, Japan and India. 'A Taste Of Home' is his third cookbook and is less stylistic and less intimidating than the first 2 books. The dishes featured in this book are very homely and unpretentious - totally relevant for home cooking for family and friends. 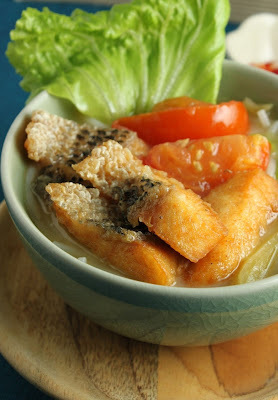 I don't suppose this is the best Fish Head Bee Hoon recipe as it does not really calls for fish bone stock but I had found a total of 3 different recipes, and all of them were using normal chicken stock. I suppose for home preparation, this would be easier to work with - it doesn't quite require one to tackle the possible fishy smell of the stock. What I have done a little differently, is to boil the stock with dried anchovies and impart some flavour of the sea to it. I had bought a mixture of fish (with bones) and fish fillet from the market. The fish I bought was Shengyu, also commonly known as Snakehead fish - not cheap. The $4 portion will probably only be good for 2 servings... sometimes, you wonder, what is the point of cooking it by yourself. I probably can get it cheaper at the hawker stall or the food court. 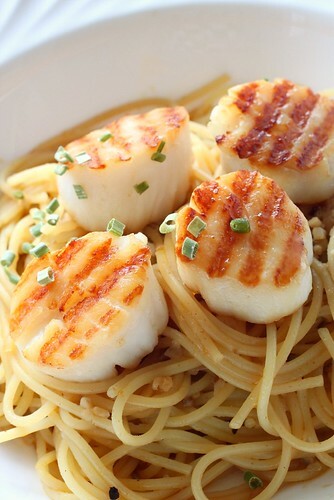 These are seasoned with a little salt and deep fried until golden yellow. I like my soup base with lots of pepper, a discernible hint of Chinese rice wine and the refreshing tang of the fresh tomatoes - all served with the ferocious cut chilli padi. I definitely will be making this again and I hope you will get to try it too.... it may also make you feel like more than a bit of a cook ;). 1. 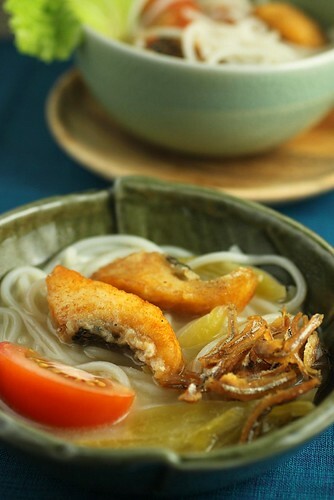 Bring a pot of water to the boil and blanch Bee Hoon until soft. 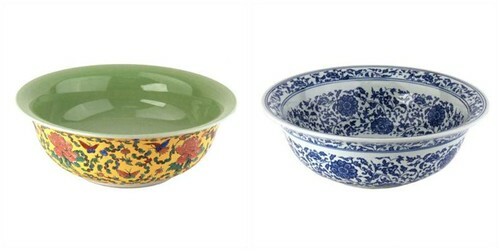 Drain and set aside and divided into large serving bowls. 2. Heat oil for deep-frying over high heat. Season fish with a little salt. Deep fry until golden brown. Drain and set aside. 3. Heat 1 tbsp oil in a wok and add ingredients for stock,except milk.Bring it to the boil, then add fish, pickled mustard cabbage, ginger, spring onions , tomatoes and milk. 4. Allow stock to return to the boil, then ladle into bowl over noodles. Garnish with lettuce and serve immediately with red chillies. Dear all, I apologise for being late with the announcment. I was figuring out how to cut and paste the random number generator onto the blog... Well #37 is the lucky number and I believe that goes to SL. SL, I don't have your email address. Please email me at kokken69blog@gmail.com to claim your prize. When I got my own place 6 years ago, I started to pick up baking again. 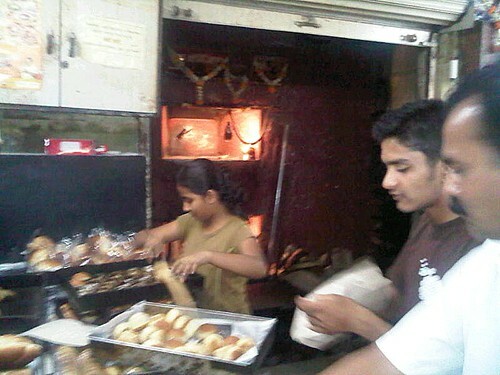 At that point, I started working with muffins - simple fare which did not require too many fancy gadgets and props. Then came the cupcake fever that seemed to grip everyone. All the mothers I know seem to be besotted by the cupcake and were baking up a myriads of colourful frosted cupcakes for their kids' school function. Yes, cupcakes are relatively simple things to make. Armed with the few basic cake mix. commonly divided into the Vanilla cake base,Yellow cake base, Chocolate cake base, these can be frosted with simple variations of butter cream. cream cheese and fondant to achieve spectacular wow factor. I was there but got bored soon. Most cupcake recipe books were run of the mill and it was almost like if you've seen one cupcake cook book, you've seen them all... That was until I came across Martha Stewart's Cupcakes. I like it because her cupcakes felt more 'adult'. Even the frosted versions were more classy. Of course, at the end of the day, the baker will need to make sure that he/she would be able to reproduce them to do justice to the creator. The Cookies and Cream Cheesecakes are single bite sized portions of creamy oreo cheesecake. 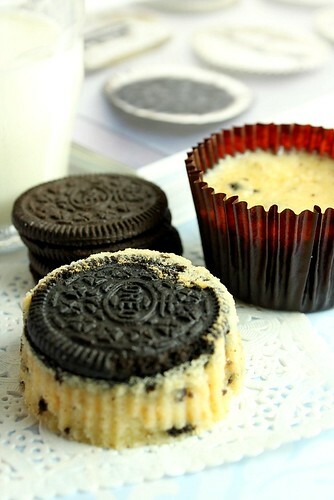 Cleverly simple, the cheese cake crust is actually a whole Oreo sandwich biscuit. If you like creamy cheese cake, this is a gem. My frustration over this is that, somehow, my cheesecake takes on a yellowish hue instead of the milky white colour as shown in the cookbook. If any one of you had tried this before, please let me know if you have the same problem. And I am having the worst day at photographing this. I thought I've finally managed to get a reasonable grip on my photos but these dark gothic morsels had me going back to my photo board 3 times. My heart plunged when I uploaded them onto my computer and had to start photographing them from scratch... It is a good thing that these don't melt and that I can still store them in the fridge. Anyway, I am absolutely discouraged by this whole assignment and have little energy left to write intelligibly. 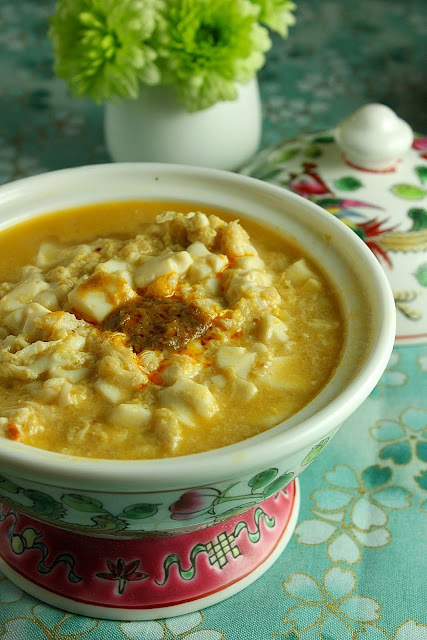 So here's sharing the extremely simple and delicious recipe with all of you. 3. Using an electric mixer, beat cream cheese until creamy. Gradually add in sugar and beat until smooth. Add vanilla extract. 4. Drizzle in egg and mix until well coporated. Mix in Sour cream and salt. Fold in chopped Oreo. 5. 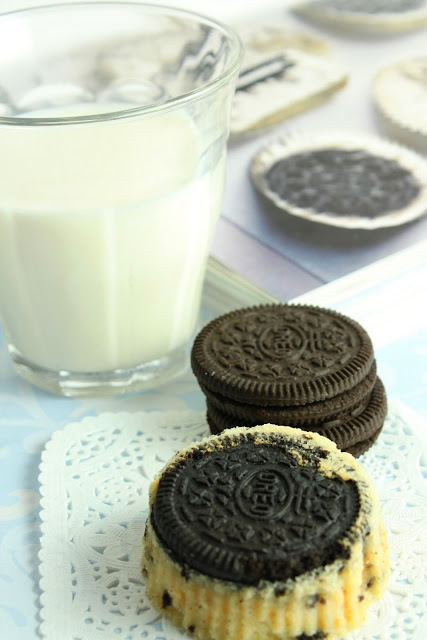 Scoop cream cheese mixture into each cookie filled cup. Bake at 135C for 22mins. 6. Cool down on wire rack in the muffin tray. Refrigerate for at least 4hours before removing from cup cake liner. 1. I am not even a big ice cream fan. 2. I not a dairy product person. I do enjoy the occasional scoop of good ice cream but I am not able to partake large quantities of it. Even when Singapore Airlines serves Haagan Daas on some of their flights, I would take only eat a quarter of it and that would be enough to satisfy me immensely. It is the same with Chocolates. You will never find me munching away at a whole bar of chocolate. A couple of good quality pralines or chocolate truffles would be sufficient to make me swoon with content. Hence I do not mind spending a little more for the really good item (I have sworn by Valrhona chocolates for many years now) for I know I won't eat alot. So really, the ice-cream maker, in all good sense would most likely become a white elephant and ought to be the first item to be crossed out from my wish-list. However, there is something strangely invigorating about smooth round scoops of colourful ice-cream. It has the power to draw out the childish and girlish emotions from women of every given age and disposition. The appeal of food lies not only in its taste and flavours but very often, its pull on the visual and memory senses is so emotionally powerful that it defies all culinary logic. The next morning, I went there early before the crowd started to build up. 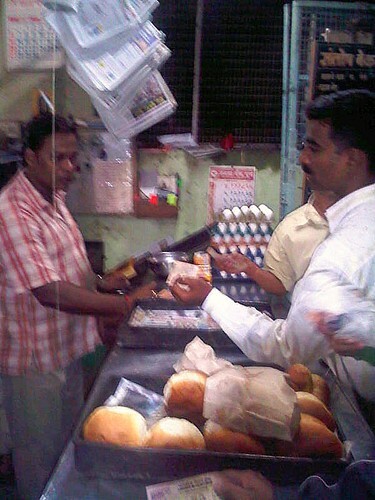 I bought 2 croissants, 1 muffin and a cookie all for S$0.35 (US$0.12). I had to stop myself from exclaiming 'so cheap!'. I ripped open the paper bag with eager hands and took my first bite of the muffin, expecting an epiphany of sorts but it didn't do anything for me.... :( It was coarse, somewhat dry and very different from the fine crumbed, rich buttery taste that I have become so used to. I was immediately reminded of my earlier experience at the Iranian cafe early this year. (I had brought back a pack of the famous Shrewsberry cookies for the office- it is still sitting in the cookie jar, untouched.) Seeing how these are flying of the shelves literally like hot cakes, I really wanted to be able to gush about it but its popularity was quite beyond my comprehension... I remember messaging L about it and he had told me that I have become spoilt by too much good food. I suppose I am and that we all are,compared to the people in India. 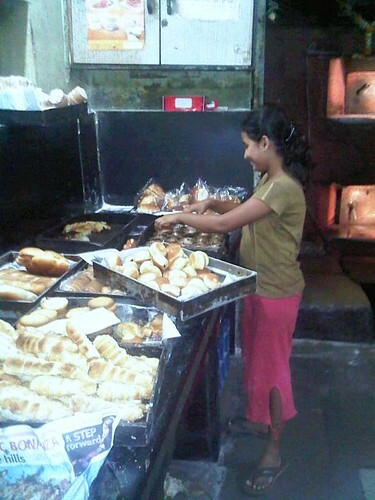 Looking at the way they embrace these simple pastry, I have a feeling that these will always remain the best pastry for them even if fine pastries would become fashionable and accesible to them in future. Well, back to my ice-cream. 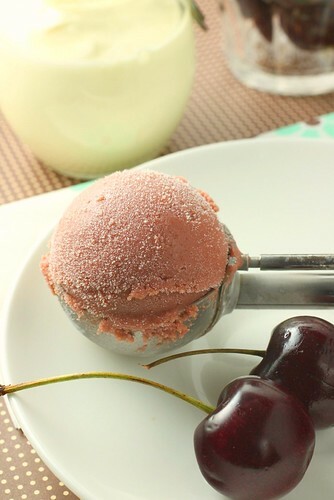 When I saw Wendy's Blueberry Yogurt Ice-cream, I had told her that I would make this soon but I do like to experiment with my food and instead of working with Wendy's recipe exactly, I tweaked a few things. 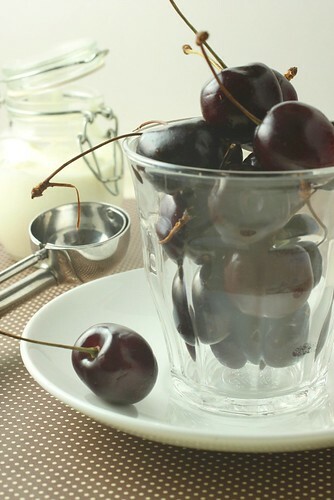 Cherries are becoming cheaper by the day and I suspect at S$1.10/100g, it could be the same price as blueberries... Hence that is what I have decided to use. Also, since I am not much of a diary person, I decided to cut down the cream component and convert it to a sorbet - with equal parts of fruits and creamy yogurt. With an ice-cream machine, the icicles will be finer and the texture of the ice cream would be alot smoother. However, since I can only covet the ice-cream maker for now, I blend the half frozen slush in the blender twice. It is decent enough and for now this will have to do. 1. 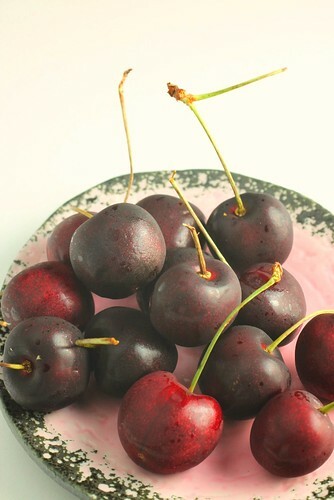 Blend cherries, yoghurt and sugar until smooth. 2. Add in lemon juice and kirsch. 3. Cling wrap the bowl and refrigerate over night. 4. Blend cold yoghurt mixture and freeze in a freeze proof container for 1 hour. 5. Take out half frozen mixture and blend it in the blender again. Return to freezer for another hour. Repeat blending. 6. Freeze in the freezer in a covered container until frozen. 7. 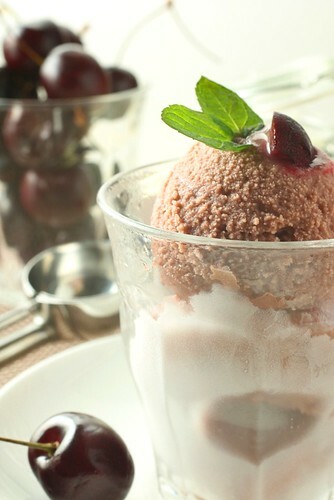 Serve with fresh cherries and mint leaves. If you haven't noticed, China is getting rich. Even though more than 90% of the chinese population is still struggling to make ends meet, there is a very significant number of Chinese who are so cash rich that they can afford to swarm the Louis Vuitton boutique in Singapore and clear out the shelves in one single shopping spree. China is where one would find the newest and most avant garde architectures and ID today. Hotels and restaurants in Shanghai and Beijing are trying to outdo each other with visually breathtaking interior designs. 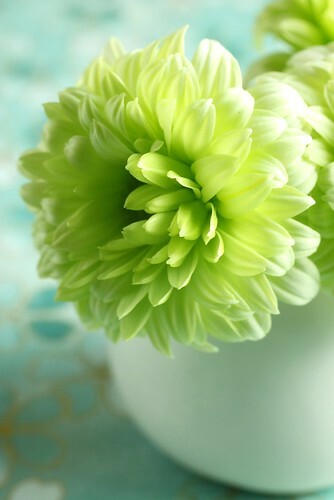 (though quality is of secondary priority now, appearance is King.) 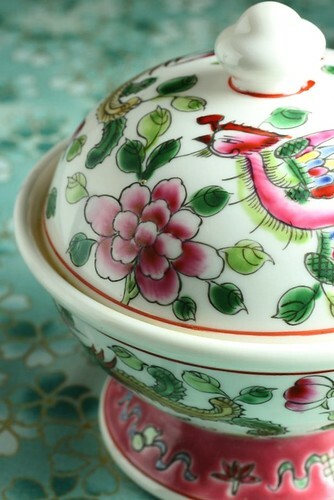 I have always liked Chinese/Asian elements and seek to incorporate these into my living space. Though, with the generally small space we have here, one needs to be careful not to weigh down the interior with over-the-top designs. 6 years ago, when I moved into my apt, I had fun tearing down the whole apartment and building everything according to my very own 'vision'. My inspirations were basically gathered from the hotels and restaurants I have been to during my business travels. During my recent business trip to Shanghai, I did not have good food but found consolation in being stuck in a very nice hotel for the whole week. 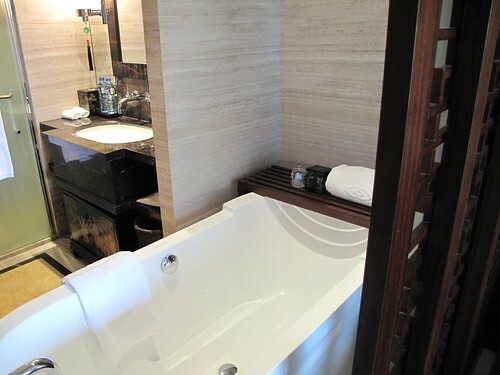 The bathroom at the Sofitel Shanghai delighted me immensely. 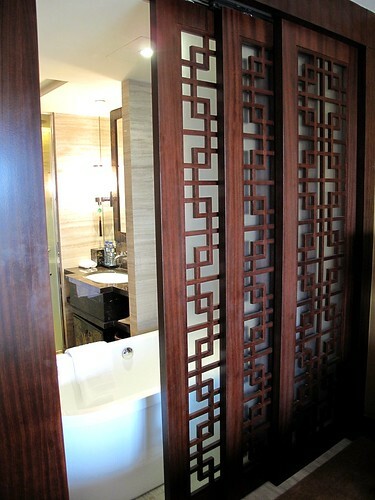 I loved the way they had incorporated the Chinese elements into the bathroom. I loved the simple lines of the Chinese Screen doors that separated the bathroom from the bedroom and thought the use of a traditional Chinese Chest as storage under the sink was quite brilliant. Yes, I would definitely file these away for future reference and I am bookmarking these beautiful bathroom sinks which I found on CSN's Just Vainities on-line bathroom store for the perfect finishing touch to the Asian theme bathroom! Shanghainese food is not one of my favourite Chinese cuisine but there are a couple of dishes that I do look forward to having. 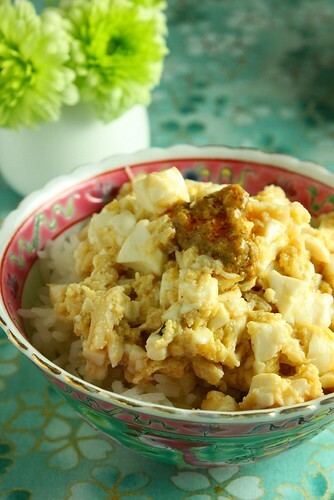 Among them are the famous Xiaolong Bao(小笼包),Braised Lion Head Meat Ball(红烧狮子头) and Crab Roe Tofu (蟹粉豆腐). 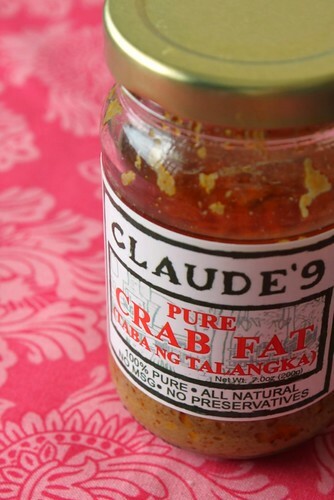 When I was using Taba Ng Talangka for my spaghetti dish last week, I realised I could totally work this into the Crab Roe Tofu. 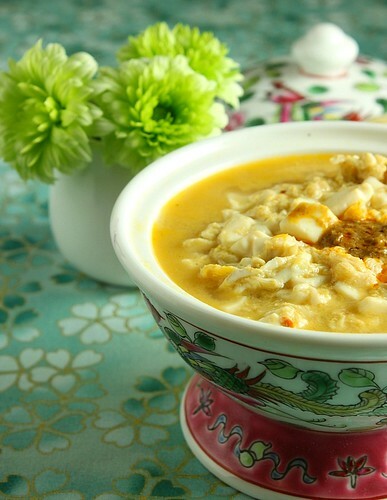 Braised with crab meat and tofu, the Taba Ng Talangka imparted the distinct sweet flavour that can only be associated with seafood. 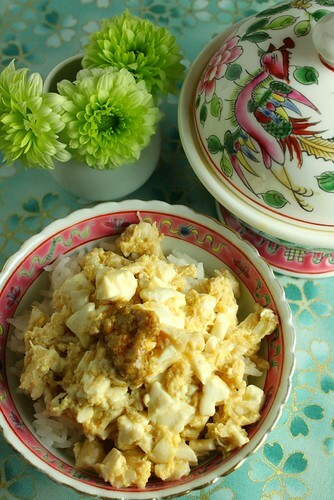 It was so flavourful that all you need is a bowl of steamed white rice and you will find yourself scraping at the very last rice grain at the bottom of the bowl. Have fun shopping and good luck! The Giveaway will be opened for a week and will end on 28th July US EST time. 1. In a hot wok add 1 tbsp of oil. Fry garlic and ginger until fragrant. Add crab meat and stir fry quickly. Add Chinese Rice wine. 2. Add Tofu and chicken stock. Cover to braise until stock boils again. Add Taba Ng Talangka and cover and braise again for 5 mins. 3. Add Salt and Pepper to season. 4. Mix starch with water in a bowl. Add starch mixture little by little into boiling tofu, checking for thickness. 5. 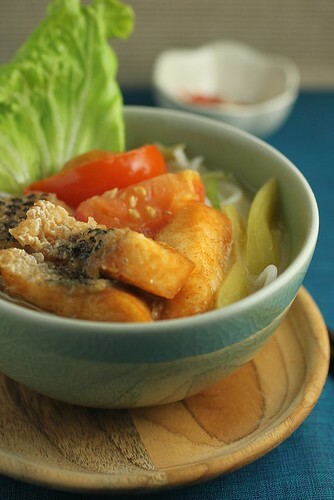 Dish out and serve with steamed white rice. Jumping on the Cherry wagon again - with prices coming down as the cherry season peaks, they are hard to resist. Wendy, you will be envious to learn that these are now going at S$11/kg! Geez, I am sounding like an auntie now and I probably look the part of one as I continued to circle the crates of American cherries while clutching onto my kilo punnet of cherries. On the other side of the 'cherry island' at Carrefour, I overheard a Chinese Auntie telling the assistant that she wanted to buy 5kg of cherries.... judging from the way every shopper seems to be clutching onto a bag of cherries, I would say we are all going gaga over cherries. 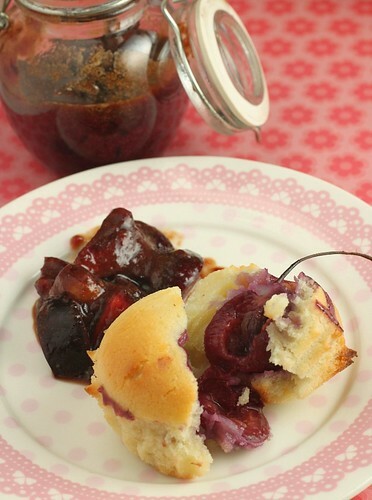 This recipe is taken from Martha Stewart's Cupcakes. 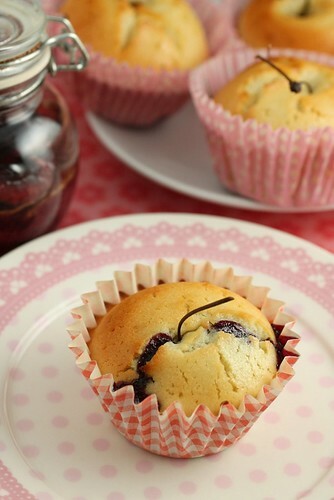 Essentially a Financier recipe that calls for the use of browned butter, this provides an interesting alternative to the standard yellow cupcake, vanilla cupcake or chocolate cupcake that form the basis of almost all cupcake recipe cookbook. 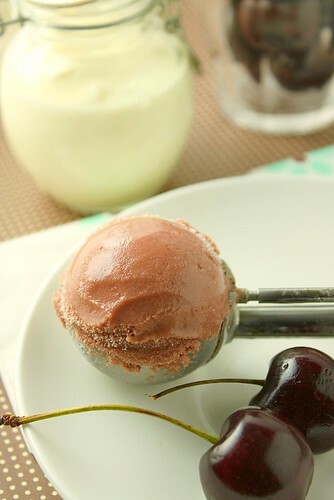 The texture is deliciously springy and I only wish I had used more cherries to impart more tartness to the cupcake. 2. Sift flour into a mixing bowl. Add ground almond, sugar and salt. Wisk to mix well. 3. Heat and brown butter in a heavy saucepan. In the mean time, whisk egg white into (2). 4. When butter has turned brown, (be careful not to burn butter) whisk butter into egg white and flour mixture. Add butter in a slow trickle to ensure homogenous mixing.Let batter stand for 1/2 hour. 5. Add 2 tbsp of batter into cup cake liners. 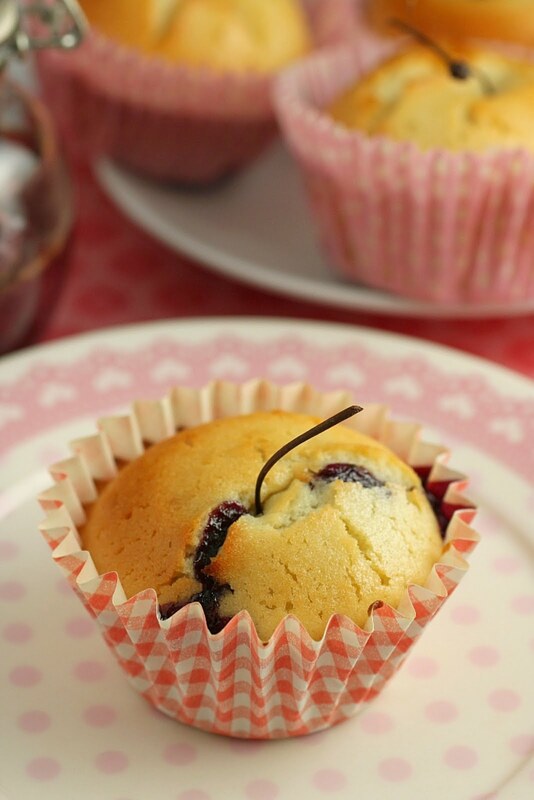 Insert a cherry (with stem intact) in the middle of cup cake. 6. Bake at 200C for 12 mins - 15 mins. 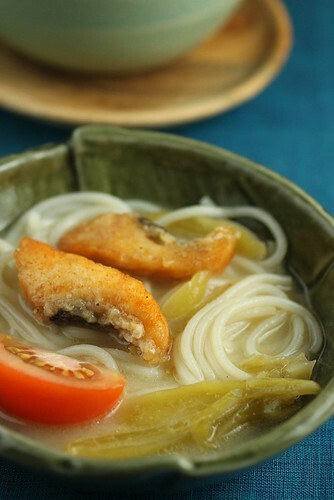 Popular dishes prepared with Taba ng Talangka are usually simple to make and include eating it with rice, (paella style) and cooking it with seafood pasta, to name just a couple. 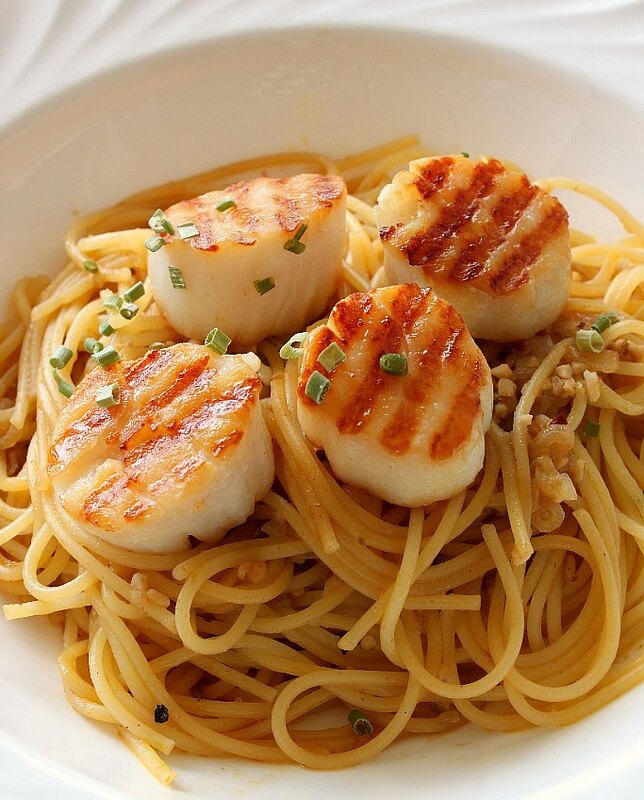 In Amy Ma's post, the chef had served the spaghetti with seared Hokkaido scallops, Chef Laudico served his linguini with calamari... and so it appears that this rich curd-like roe is best used to enhance the flavours of the sea. When I finally got down to make this a couple of days ago, I decided to do it with vermecilli pasta and serve it with seared scallops. Feeling strangely sinful even before I started cooking, I felt oddly inhibited as I stared at the rich curd swimming in the even more oily fat ( the roe is prepared and preserved in copious amount of oil, salt, calamansi juice and what not). Perhaps it was because I had been over eating on my last business trip or perhaps it was due to the stubborn 3kg weight I had put on after I started blogging.... but whatever it was, a little voice was nagging inside me telling me that I SHOULDN'T eat this, that I have to be more disciplined in my food consumption. 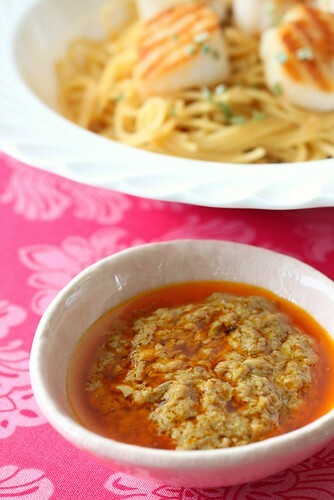 I then modified Amy Ma's recipe and omitted the cream that was added to the pasta sauce to make it even richer and creamier. 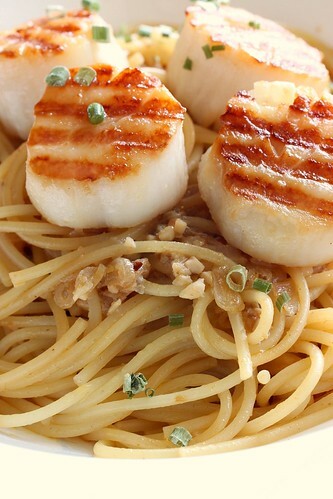 Without the cream, my pasta still retained the breezy flavour of the sea but it lacked the smooth, indulgent creaminess I had tasted at Chef Laudico's restaurant. The 'kick' was not there and I have to admit that despite all good senses and reasonings, some food are meant to be enjoyed in all its artery-clogging, cholesterol reeling, libido suppressing goodness - so, I will have to do this again the right way, without inhibitions and without regrets! Musk Melon Jelly - Will You Pay $200 For a Musk Melon? The Japanese are a strange group of people. Their obsession with perfection can be so infuriatingly intense that very often it creates a whole new set of market values for seemingly simple things - the worst case of which spoils the market and makes it difficult for simple mortals like most of us to partake in some of the most wonderful experiences available. When I was in Tokyo for a business trip in April, my Japanese colleague had introduced me to the most expensive fruit shop in Japan when we were switching trains at Nihonbashi. Having been established for 120 years, Senbikiya is not your ordinary fruit shop. It prides itself in offering the most popular, the highest quality, the most exotic and last but not least, the most expensive fruits in Japan (and possibly in the world !). Fueled by the unique Japanese fruit gifting culture, Senbikiya continues to thrive and has become the emblematic brand in luxury fruit gifting for the wealthy and powerful. The musk melon pointed out to me by my colleague was perched on a pedestal. 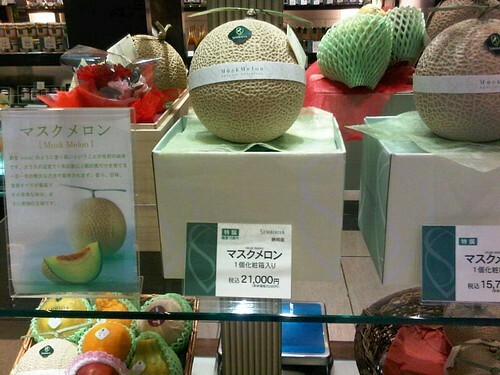 A perfect round Melon with the price tag resting boldly at the foot of the pedestal that read 21,000Yen - which was roughly equivalent to US$200. My eyes widened in disbelief and I remembered I had immediately snapped a photo with my Black Berry and messaged it to L.
I have never really liked honey dews, or similar melons. I would normally give them a miss at breakfast buffet tables for I feel that these fruits are tasteless and has a sickly funny smell. L, however seems to appreciate it more. He had told me he used to make it a point to lug a couple of musk melons home from Tokyo whenever he was there for business meetings - whatever for? I could never understand. He had urged me to try the fruit at least once, suggesting that I look for the US$50 varieties which are already very good. Then, at least I would have earned the right to brag about it - he continued to cajole. Of course I didn't listen to him! So silly to lug a big melon home - I prefer to use that luggage weight allowance to get a couple more baking trays! Anyway, that was in April. Then, recently, as I was shopping at the local Japanese supermarket, Isetan here, I spotted some imported musk melons, normally priced at S$79 (about USD50) on 30% discount. I supposed these had already ripened hence the supermarket was in a hurry to sell them off... I hesitated just a little, before I decided that this would be a good opportunity to try it and find out what all the fuss was about. 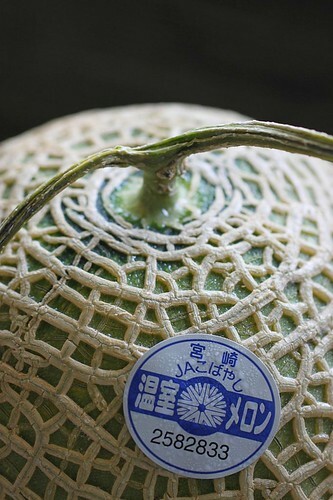 The symmetrically round melon with a lovely mesh-like pattern and a singular horizontal stalk was a picture of perfection. L had told me that the denser and the more defined the mesh-like pattern is, the more costly the fruit would be. I cut the fruit in half to expose a tender green colour in the flesh. As I had suspected, this was getting ripe hence some part of the flesh was already showing some transparency. However, what caught my attention first was the sweet elegant fragrance of the fruit. The flesh was so juicy that I had to hover over the sink when I bite into it. (the Japanese would faint if they knew that I had dug into the prized fruit in such an uncivilised manner!) 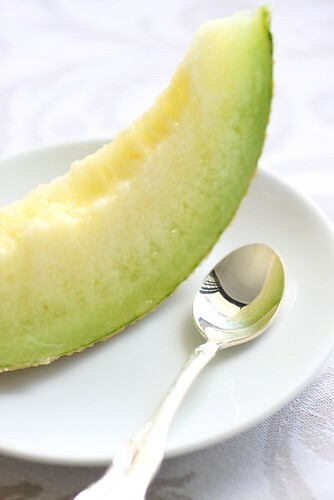 The sweet flavour was totally unlike the honeydew and rock melon that we usually get here! The copious amount of juice makes this an extremely cooling fruit to eat - as cooling as a watermelon. In addition, the sweet floral perfume of the fruit indicates that it has been preferentially nourished by mother nature. I had read somewhere that one of the reasons why this was so expensive is because each tree would only produce one fruit. During cultivation, the farmers, apparently would trim the vines of the tree to only allow 3 fruits to blossom. 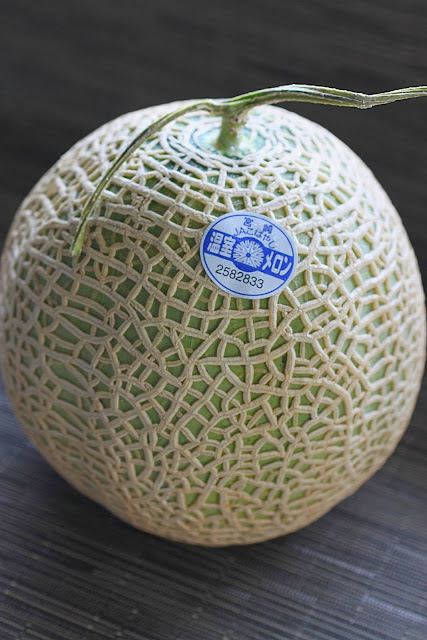 When these baby melons grow to about fist size, the farmers would select the most promising melon and cut off the other 2 in order to channel and lavish all the nutrients on the one singular melon that would be nurtured to eventually become the $200 Prized Musk Melon. Such is the Japanese's fixation on perfection! It wouldn't be right if I don't blog about this rare possession. However, it is after all, to the Japanese, the King of the Fruits - hence as much as I would like to work with it, I couldn't bear to detract the carefully cultivated taste with excesses such as cream or milk. I found a simple Japanese dessert recipe that requires the fruit puree to be mixed with gelatine and a little sugar and a dash of lemon juice and whipped to a foamy jelly. I used about 1/8 of the melon for 2 little cups of this dessert and saved the rest for pure enjoyment.... and yes, I can now brag that I have eaten the prized Japanese Musk Melon and I would even dare to go to the extent to say that the Japanese Musk Melon would be the only type of honeydew melon I would eat from now onwards! (no, I am not being snooty - remember I don't touch honeydew or rock melons to start with.) If you have the opportunity, indulge at least once and, as L had said, you would then have earned the rights to brag about it! 1. 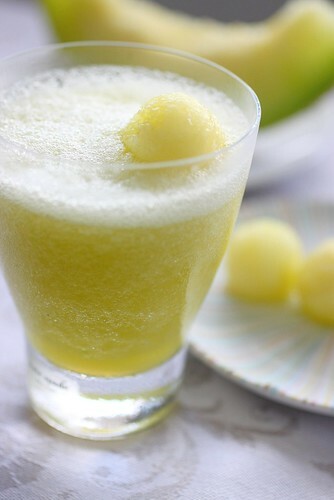 Blend the melon in a blender to form a puree. 2. Heat puree to warm to break down enzyme and cool down. 3. Mix gelatine with 50cc of water. Set aside. 4. 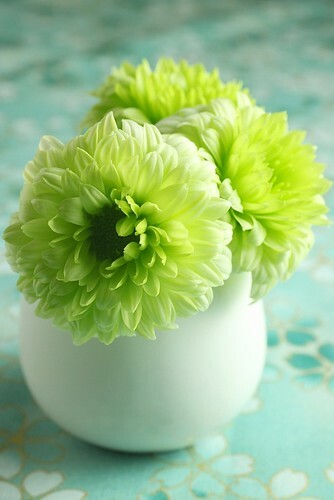 In a heavy pot, add water and sugar and heat to dissolve. Remove from heat and add (3) and ensure gelatine is completely dissolved. Add lemon juice. 5. Add (4) to (2) , mix well and refrigerate for 1 hour. 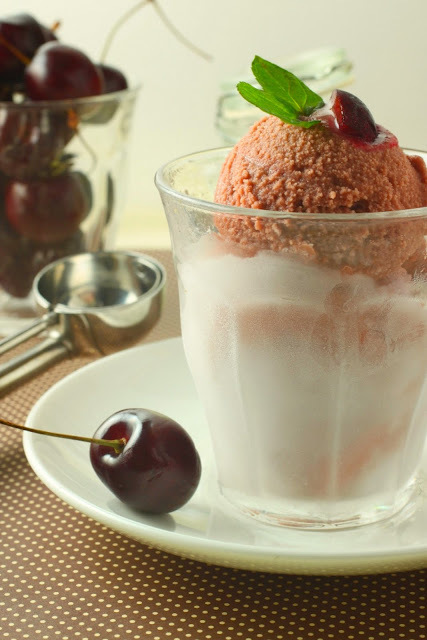 Whip the refrigerated mixture with an electric mixer over a bowl of ice water until fine foam is formed. 6. Spoon into cups and refrigerate till set. Oh No! Not Another Food Blog! Welcome to Køkken69- my food blog dedicated to the documentation of my experiments in the kitchen. It is here that I try to create everything from easy gourmet recipes, to pastries,to easy Asian recipes. To get regular updates on my postings, follow me on Facebook and Twitter.